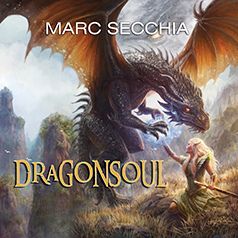 In the third installment of Marc Secchia's Dragonfriend series, epic powers collide in the worlds above and below the clouds. Can Hualiama forge a path, a new way, as the first shapeshifter dragoness? Stricken. Dying. Laid low by the accursed dragon haters, Hualiama must confront the greatest powers of the age as Dramagon's disciples encircle the ultimate prize—her. A girl born of fire, raised by dragons and imbued with the terrible, corrupting power of ruzal. Now, portents fill the sky. Legendary armies fly to war. The prophesied comet crashes into the Island-World, bearing the spirit of a malevolent ancient dragoness, Numistar Winterborn. She will obliterate any that seek to thwart her ambitions—all the armies of men and dragons, the monstrous war-machine of Shinzen, warlord of the giants, and most especially, Hualiama and Grandion, the Tourmaline dragon.